Online role-playing games are booming in China. The influence of virtual world is spreading even into day to day life. 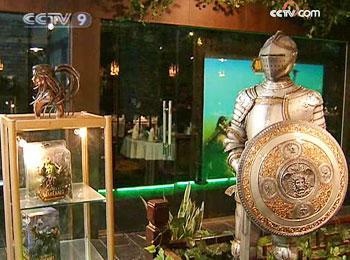 A newly opened Beijing restaurant captures the trend. The interior decoration of the place is inspired by one popular online game. The restaurant's entrance is a real-life re-creation of the opening animation from the game, The World of Warcraft. The dining area is called the Hall of Snow Storms." Here, an immense plasma screen displays action from the game. There's a towering tree at the centre of the dining "portal," creating a pleasing ambience for leisurely diners. Most patrons are fans of the multi-player game. Warcraft would find a comfortable gathering place. 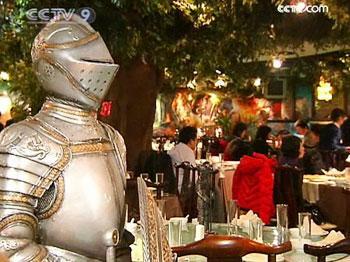 Guarding the walls of the dining area are warriors clad in ancient armor. The walls are highlighted by graphical images taken from the game.